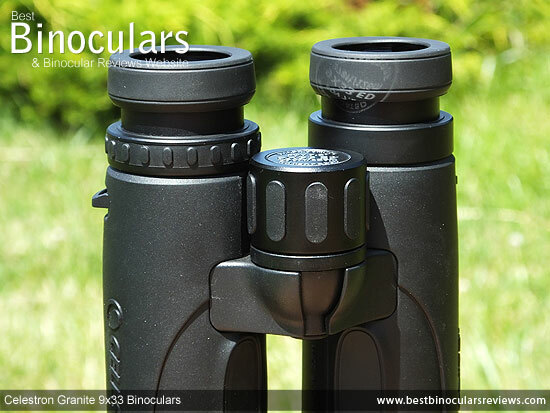 As with most of the very best binoculars, the main skeleton of the 9x33 Granite is manufactured from a magnesium alloy that has a very good resistance to corrosion, is very strong as well as lightweight. On top of this skeleton, all of the exterior, apart from the bridges and parts of the focus wheel is covered in a very hard and somewhat smooth black rubber coating. Because of this, it is perhaps not as tacky as some and so provides just a little less grip than it possibly could, especially when wet. This hardness of the rubber coating and because it is fairly thin also means that it probably does not protect the optics as much as some that I have used in the past. On the plus side, it finishes off the binoculars really and they look as well as feel like a high quality product. Like all the other models in the Granite series, the 9x33 version uses roof prisms and has an open bridge body design. This shape can slightly reduce the weight of the frame, but more importantly frees up the mid section of the barrels for an area where you can get a very secure, one handed grip on the binocular. This may sound like a small point, but it is something that I really like. I say this because there are times, when for example you are climbing up steep inclines or over large boulders that you really don't want to have your bins swinging by the neck strap as they can easily smash against something like a rock. So it is in these situations that it is great to be able to have a secure one handed grip on your optics to keep them safe, but also keep the other hand free to help you negotiate the terrain and keep yourself safe as well! On the insides of each barrel there is an indent that my two middle fingers fitted perfectly when holding the bin up to my face. Likewise on the underside of each barrel there is another indent designed for your thumbs. These indents are perfectly placed and whilst it is only a tiny detail, they do an excellent job of just helping you to hold them in the right way, at the right place to make the binoculars nicely balanced. At about 6mm from the ends of the barrels, the objective lenses are not set quite as deeply as some, but this should be enough to provide them with some sort of protection from scratching, dust and moisture when using the device. The cap on the middle of the front hinge can be unscrewed, revealing a standard �-inch thread that you can then screw a binocular tripod adapter into and then attach it to your tripod. Speaking of protection from the elements, the Celestron Granite 9x33 is completely sealed and is therefore water proof, although they do not say to what level or standard, so to be safe, I wouldn't be dropping them in the river! Apart from water and general moisture, this sealing also prevents dust or other tiny particles from getting inside the system, which could also spoil the view. During manufacture, all the air inside the body is replaced with nitrogen. This Nitrogen purging helps protect the internal optics from fogging or misting up and because it is now a moisture free environment, will also protect the inner workings from any corrosion. 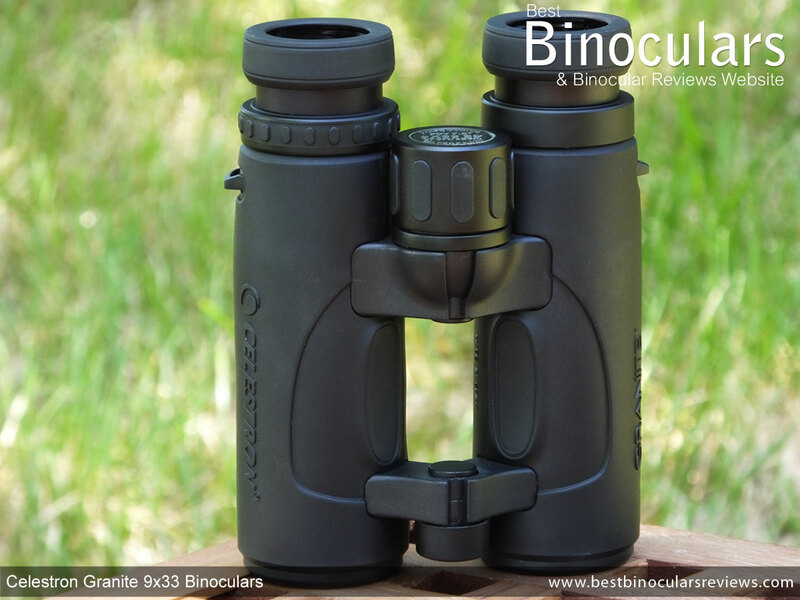 Most mid level and even some higher end binoculars use a plastic for the eye-cup housing, whilst Celestron have opted for metal ones on the Granite series, not only is this an indication of quality, but they feel more robust and the twist-up helicoid mechanism works ever so smoothly. This metal casing has then been covered in a reasonably thick, soft rubber giving them an external diameter of 38mm and which is 6mm wide at the end that is pressed against your face, making these just is about average when it comes to comfort when compared to others. The twist-up mechanism has one fixed stop in between fully extended and fully retracted so they don't give you as much flexibility as some which have more and the 14.1 mm (0.56 in) of eye-relief is a little on the short side and is often the small price you have to pay for such a wide field of view. So if you wear glasses and want to keep them on whilst glassing this may be a consideration, but will depend a lot on how far your glasses sit from your face. I used my sunglasses to test the eye-relief, and I was just about able to get the full field of view, with only a slight hint of a dark halo around the edge of the view with the eye-cups fully retracted. So for me and my "glasses" the 14.1 mm of eye-relief is just on the cusp of being enough. Obviously for on-eyeglass wearers, or those who don't wear their glasses when using their bins, this is not at all an issue as almost everyone will have the eyecups in the fully extended position to get to the correct amount of eye-relief. The minimum stated IPD (distance between the centers of the ocular lenses) is 56mm (2.2in) and the max is 73mm (2.87in), which after measuring, I can confirm is correct. 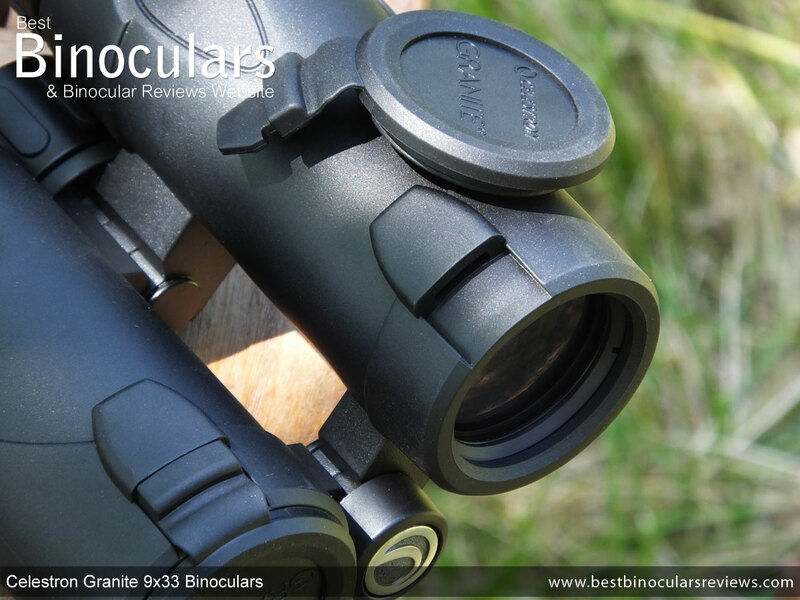 This range is pretty good, with the minimum being about as narrow as it gets on this design of binocular and so will be ideal for younger users, or those with close set eyes. For further information and comparisons, please read my interpupillary distance guide. As with almost all roof prism bins, you focus the binocular with a centrally located wheel. Whilst this focus wheel on the Granite looks to be made from metal, I think it is a plastic, but has a diameter of 31mm which is a good size. This combined with raised rubberized areas on the wheel and a fairly high profile make reaching and turning it from the standard grip nice and easy, even with thick winter gloves on. It takes about 1¼ turns of the wheel (450°) to take the focussing plane from it's near focus of 2.5m (8.2ft) to infinity. This is fairly moderate gearing makes it easy to be accurate when fine tuning the focus as well as being reasonably quick when you need to go from one extreme to the other. Positioned just below the eyecup on the right hand barrel is the diopter adjustment wheel, which has small raised rounded rectangles made from rubber for added grip. You use it to adjust the focus of each barrel independently to counter any differences in your eyes. Because this only really needs to be done once and then should be kept at this position, you want it to have enough resistance to movement to make accidental changing of your setting uncommon, but not too much so that it makes adjustment difficult. On the pair I was testing this "friction" was just about right, but perhaps just a little tighter would have been better. The best solution is to have a lockable diopter, which these unfortunately don't have. Another point to make is that apart from the neutral point and the + and - signs, there is no scale or any other reference points, so if your particular setting does not line up with one of these, you may consider making your own mark with a knife or pen so that if you do change it, you can return to your setting without having to re-calibrate your bins. 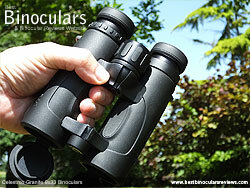 For more, take a look at my guide on how to calibrate & focus binoculars. I would just like to quickly add that it is always important not to just take the weight of a binocular on it's own. Remember this Granite uses a magnesium chassis, which probably weighs less than aluminium ones, but is not quite as light as the much cheaper polycarbonate ones that are often used. These bins also have high end components like metal eye-cups, which are far better, but also heavier than the plastic ones used on cheap binoculars. 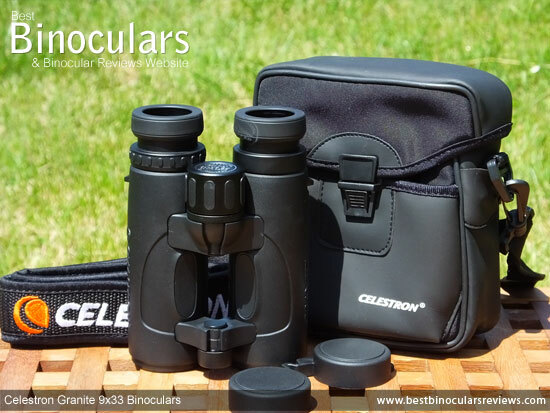 Celestron state the length as being 5.4in (13.8cm) which is achieved with the eyecups fully twisted in and without any lens caps. Fully twisting out the eyecups, it extends to 5.6in (14.3cm). Adding the objective and ocular lens caps: 5.9in (15.1cm). The width is advertised as 4.9in (12.5cm), which is the width at their widest point when fully opening the central hinges. In this state, their height is 2.1in (5.5cm) which is what is advertised. Fully collapsing the hinges, reduces their width to 4.1in (10.5cm), but raises their height to 2.7in (7cm). These measurements are fairly standard for a mid sized bin and thus obviously makes them quite a bit smaller than most full-sized 42mm bins. Overall I really like the weight and feel of these 9x33 Granite's in my hands. They have a good balance to them and just enough weight to help keep them steady, but not too heavy to make holding them up uncomfortable at all. I was not able to find out much about the ocular lenses apart from saying that they have a diameter of 18mm, which is about the same as most other mid sized bins I have used. 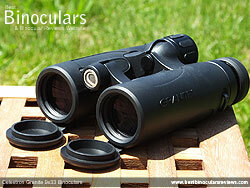 The Celestron Granite has multi-element objective lenses, one of which is made from extra low dispersion (ED) glass. With this ED glass, the designer of the optical system has more control and is better able to direct the individual wavelengths of light as they split up when passing through the lens and is thus better able to focus them all again at the same point after they have passed through the lens. Doing this minimizes chromatic aberration, producing sharper, better quality images that are fringe free and with a more accurate color reproduction. For more, read my guide to ED glass on binoculars. Celestron advertise their optics as being "Fully Multi-Coated". What they mean is that all air-to-glass surfaces on their lenses have had multiple coatings of an anti-reflection material applied to them. Lower quality optics only have single layers on all or even just some of their lens surfaces, which can make a huge difference on just how much light is reflected away and does not get to your eyes but which can cause flaring and ghost images. Remember the better the transmittance, the better quality and brighter image you get and that is why I often see smaller high spec bins outperforming poor quality ones with larger lenses. 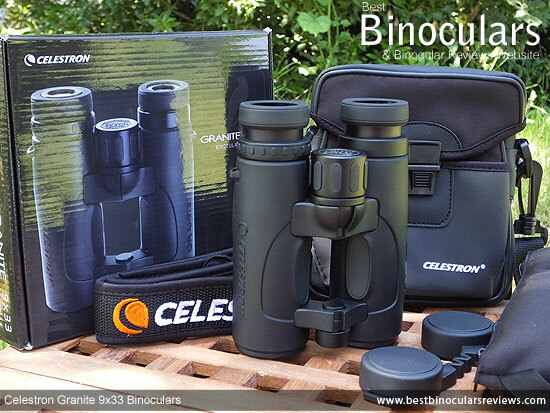 These and all the other Celestron Granite binoculars use roof prisms in their design, which have been made from great quality BaK-4 glass. Because the path of light through the roof prism is straight, it enables manufacturers to make sleeker, more compact bins than the traditional porro prism design. Celestron have applied phase correction coatings to their prisms on the Granite, this counters the slight loss in image sharpness with the "phase shift" that occurs in the roof prism design by returning the wavelengths of light back to the correct color phases. Another drawback to a roof prism is that one surface of the prism does not reflect all the light that hits it. So to improve this, better quality bins add a highly reflective material to this surface. 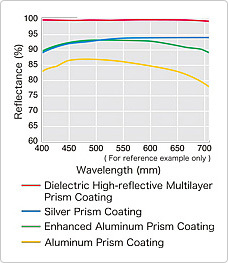 An Aluminium mirror coating is used on cheaper optics, that is aid to have a reflectivity of between 87% and 93%. Better, but more expensive is a silver coating that boosts the reflectivity to between 95% and 98%. However the very best binoculars, like these Celestron Granite's use very expensive dielectric prism coatings that have a reflectivity of more than 99% to further increase light transmission for a brighter and even better quality image. So as you can see their FOV makes for a really nice compromise between the two more commonly used magnifications of 8x and 10x, which will appeal to those who just want a little more image detail than most 8x bins can provide, but don't want to sacrifice too much on the width of view as you would have to with most 10x bins..
Celestron advertise the 9x33 Granite as having a near focus of 8.2ft (2.5 m), which I will use when rating them, but on the pair that I was testing I measured it to be a little nearer than that at just over 7ft (2.15m). Which is OK, but not great as on a mid or full sized bin like these, I consider anything at or under 6ft to be excellent. So If your main intended use for these is observing things like flowers or insects for a close distance, these would definitely not be ideal. Their 14.1mm of eye-relief is once again OK, but not excellent. It however should be just enough for most people who wear glasses to be able to use the bins with their glasses on and still get the full view. However if you are worried about it, you may wish to look at binoculars that have very long eye-reliefs (over 16mm) to make sure. 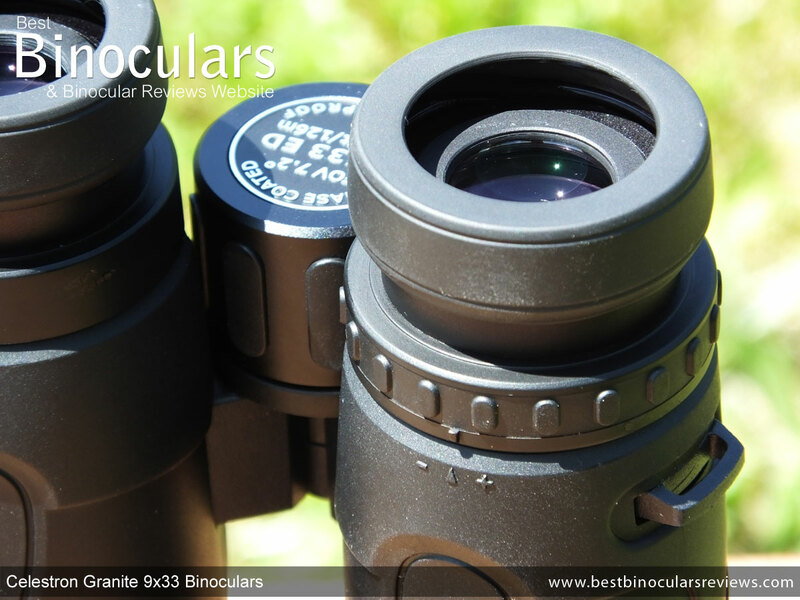 To try and ensure that I judge the quality of the image as objectively and as accurately as I possibly can, I subjected the 9x33 Granite to a number of comparison tests against a range of my "benchmark" binoculars. Because I don't actually have an 9x33 control, I chose to compare the view through these with that of my mid level control 8x32's as well as my mid level and top spec benchmark 8x42's. These tests were carried out twice, once in good light around mid day and again in poor light, just before and just after sunset. As these Celestron binoculars have ED glass in their lenses, which is used to help limit the amount of chromatic aberration that is seen as color fringing, I was expecting them to perform well in this area and I was not to be disappointed. To test for it, I focus on the edges of objects that contrast highly with their background. On some binoculars you can see a blurry red/yellow or sometimes purple halo around the edge of the object, but not these. If there is any color fringing, I really could not make it out. If you look right at the edges of the view on most binoculars, there is an area where the image gets softer and then completely blurry. 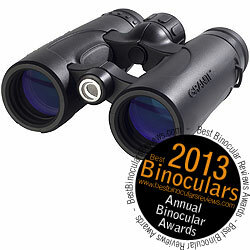 The amount of softening on these Celestron Granite binoculars is very minimal, almost to the point of being nonexistent. Which is very impressive and ranks them with the very best in this area. This rather surprisingly contrasts with my assessment of the 8x42 Celestron Granite when I reviewed them, as I thought that the amount of image softening was not as good as the best. To me the colors of the image produced by the Celestron Granite 9x33 are vibrant, but not abnormal, this is a good thing and is unlike the artificial looking tints or washes that you sometimes see, especially with cheaper optics. The image contrast is also good and you get a nice sense of depth with the contrast between dark and light colors. Comparing the view of these with that of my controls in good light did not reveal any perceptible differences in image brightness. This is not surprising when we consider that in good light, my pupils are most probably dilated to something like 3mm in diameter. This is smaller than the exit pupil of a 9x33 (33 ÷ 9 = 3.7mm), an 8x32 (32 ÷ 8 = 4mm) and an 8x42 (42 ÷ 8 = 5.25mm) and therefore my pupils are letting in less light that is being provided by all three sizes of binocular and so they all look to be the same brightness to me. It was not until the ambient light became poor just after sunset and my pupils had dilated that the smaller exit pupil on the Celestron became a limiting factor and I was able to notice a difference in image brightness. Still I have to say that this difference was very minimal, even when compared to my mid level 8x42 binoculars. This is probably down to the superior anti-reflection coatings on the lenses and the very highly reflective dielectric prism coatings on the Celestron that really help to ensure that as much light as possible passes through the system and onto your eyes. For more, read my complete guide to the exit pupil that goes into more detail image how perceived brightness is affected by the size of the exit pupil and the size of your pupils. To test for their depth of field, I focused on an object about 5 meters away and then moved my view backwards without changing the focus wheel until the view became out of focus. I then compared this distance with my "control" binoculars. Whilst it is not bad, this is one area where these Celestron's did not perform that well. However as I was comparing them to lower powered 8x bins, this is to be somewhat expected. The padded section of the neck strap is 1.5in (3.9cm) wide and reasonably well padded at about 4mm deep, however it is not curved, to fit better around your neck and shoulders. The thinner cord that connects to your binoculars is sewn securely onto the padded section. This if fine, but even better are the ones that have a metal loop, that gives you some more play between the two and so does not move the padded strap from its position around your neck as you lift and lower your bins to and from your eyes. So whilst the strap is well made, comfortable and does the intended task of carrying your bins very well, it just lacks a few of the very small details that would elevate it to the level of the very best. I really like the objective lens caps on this Granite, because the fit well and unlike most others that fit over the ends of the barrels, these fit flush within the inner surface of each barrel that also helps them from accidentally coming off and makes for a much sleeker and cleaner look. Like many binoculars the caps are tethered to the ends of the binocular, however unlike most that simply use a rubber loop to wrap around the barrel, these use a clip that fits into a recess under each barrel for a far more polished and professional look that really helps to maintain the beautiful clean lines of the Granite. Sometimes called a rain-guard, the cover that protects the eye-piece and the ocular lenses is made from a soft, flexible rubber, which fits just tightly enough over the eyecups so as to not easily come away accidentally. There is a flexible bridge between the two cups on the cover that easily adjusts to whatever distance you se the eye-cups apart meaning you can attach it to the binocular and keep your desired setting. The rain-guard also has a single loop on the right cup that you can use to thread the neck strap through should you want to keep the cover handy at all times. I love the fact that the Celestron Granite's come with a good quality binocular harness included, which will please those who want a very secure and hands free way of carrying your bins about. Another big advantage of this harness when compared to a neck strap is that it keeps your optics closer to your body when not in use and so won't swing about as you clamber over difficult terrain. 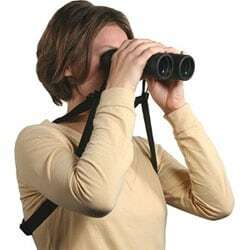 Also sometimes referred to as binocular suspenders it is relatively easy to put on and wear. I thought it was very comfortable and the well ventilated rear webbing means that you sweat a lot less at this contact point than you would otherwise. Also included is a good quality Lens Cleaning cloth that is useful for lightly cleaning your optics, but for a more comprehensive clean, I would still suggest getting a good optic lens cleaning kit. 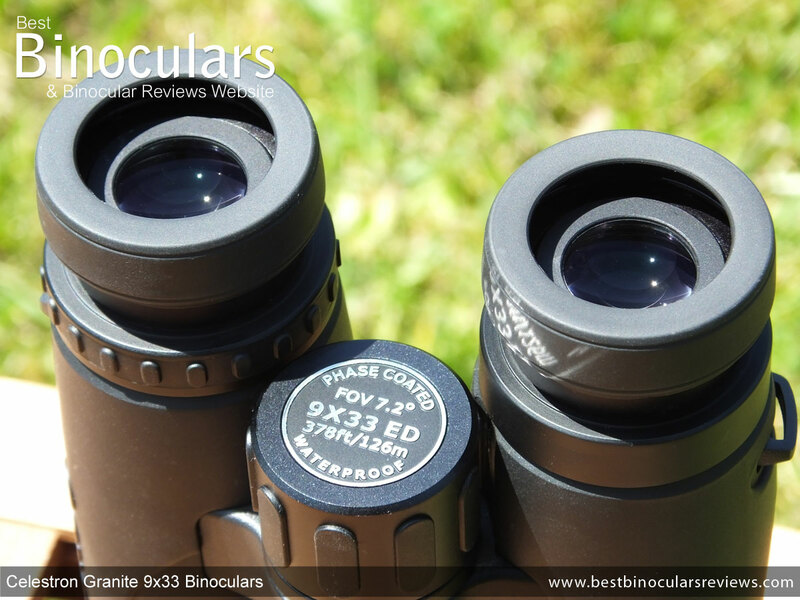 Strong Points: Their wide FOV is excellent, maybe not quite as much as the best 8x bins out there, but remember you do get a slightly more detailed view with the higher 9x magnification and so they make a great compromise between a very wide, yet detailed view. The quality of the glass and their coatings on their lenses and prisms is excellent and is up there with the very best, which it is why it is no wonder that they produce such a bright, high quality image. The addition of a harness will also be very appealing to some. Weak points? Whilst I don't think that these Celestron Granite binoculars have any serious weaknesses, their are a few things that could have made them even better. This would include a slightly closer minimum focusing distance and a little more eye-relief. However adding more eye-relief usually means reducing the FOV and so for someone like me (who does not wear glasses) this is the right way around! Ideal Uses: A mid sized binocular with a wide FOV and a magnification mid way between the usual 8x and 10x - for me these make ideal safari binoculars, especially if you enjoy viewing birds as well as the larger animals. 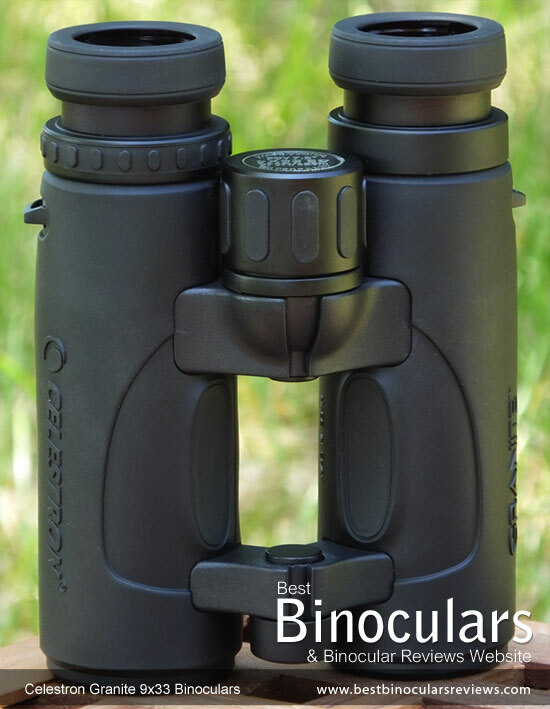 For these reasons and for their tough waterproof exterior, they also make great hunting binoculars, especially if you need to carry all your gear over long distances. Their relatively compact size and low weight are obviously ideal for travel and they would be perfect as a camping binocular. This small size and wide FOV is also the perfect combination for taking to most outdoor sporting events, including motor sports, cricket and horse racing. I would like to thank Hama, UK distributors of Celestron for arranging these to be sent out to me to review. I would however like to stress that unlike some "reviews" that I see on the web that are little more than advertisements based on the manufacturers information written by people who have never touched the binocular in question, this review as indeed all the other ones on BBR is completely genuine and my honest opinion of the binocular after using and testing them in real world conditions. Well we just got back from that Alaska trip I mentioned to you way back in December and wanted to let you know (since you asked), which product I decided on and how well they worked out. Based on your recommendation I decided to go with the Celestron 9 X 33s and was I glad that I did. They were fantastic. Not too heavy and the magnification was great. I don't know if I should say fortunate we never encountered any rain to test the Granites but I am thankful we never had to get wet. The locals kept apologizing for the bad weather ; ) We had prepared for rainy days on every port stop but luck was with us. I'm not that well rehearsed in the technical aspects of binocular reviews as you are but I will say that your review was spot on. The magnification was great and the field of vision gave plenty of that "wide angle" viewing so we didn't miss much of the wildlife we were fortunate enough to encounter. We did see the "elusive" puffin that you mentioned in many of your reviews and now I can say I have seen them in the wild. My wife asked what the fascination was with puffins and all I could tell her was that it appeared that when they are encountered they tend to hide in the rock crevices. Spotting eagles in the tree tops came easily with the Granites as well. Amazing how the binoculars actually collected the dimly lit evenings and added a brightness when viewing things. I think the best way to sum up my experience with the Granites is that prior to our trip my wife was really hesitant about spending $300 for a set of binoculars. During the trip and upon returning home all she said was how happy she was that I had gotten a good quality set for our trip. Thank you for the advice and keep up the great reviews!